"For conspicuous gallantry and intrepidity at the risk of life above and beyond the call of duty on 23 May 1944, near Carano, Italy. With his platoon heavily engaged during an assault against forces well entrenched on commanding ground, 2d Lt. Barfoot (then Tech. Sgt.) moved off alone upon the enemy left flank. He crawled to the proximity of 1 machine gun nest and made a direct hit on it with a hand grenade, killing 2 and wounding 3 Germans. He continued along the German defense line to another machine gun emplacement, and with his Thompson sub-machine gun killed 2 and captured 3 soldiers. Members of another enemy machine gun crew then abandoned their position and gave themselves up to Sgt. Barfoot. Leaving the prisoners for his support squad to pick up, he proceeded to mop up positions in the immediate area, capturing more prisoners and bringing his total count to 17. Later that day, after he had reorganized his men and consolidated the newly captured ground, the enemy launched a fierce armored counterattack directly at his platoon positions. Securing a bazooka, Sgt. Barfoot took up an exposed position directly in front of 3 advancing Mark VI tanks. From a distance of 75 yards his first shot destroyed the track of the leading tank, effectively disabling it, while the other 2 changed direction toward the flank. As the crew of the disabled tank dismounted, Sgt. Barfoot killed 3 of them with his tommy gun. He continued onward into enemy terrain and destroyed a recently abandoned German fieldpiece with a demolition charge placed in the breech. While returning to his platoon position, Sgt. Barfoot, though greatly fatigued by his herculean efforts, assisted 2 of his seriously wounded men 1,700 yards to a position of safety. Sgt. 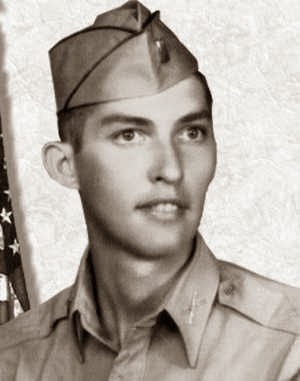 Barfoot's extraordinary heroism, demonstration of magnificent valor, and aggressive determination in the face of pointblank fire are a perpetual inspiration to his fellow soldiers." From Lieutenant Van T. Barfoot's Medal of Honor citation, awarded on September 28, 1944. Oral history by Barfoot, himself.